Insurgent students in Chile - Jo Williams, Redflag, 30 March (...) - Sauvons l'Université ! Se battre pendant 10 ans ... et gagner. L’enseignement supérieur deviendra gratuit au Chili à partir de mars 2016, financé au moyen d’une hausse de la taxe sur les entreprises d’un montant de 8,3 milliards de dollars. La loi récemment adoptée met également un terme à la subvention par l’état des établissements d’enseignement à but lucratif, aux politiques de sélection à l’entrée du système public d’enseignement et établit un plan décennal d’éducation gratuite pour tous les élèves du primaire et du secondaire. 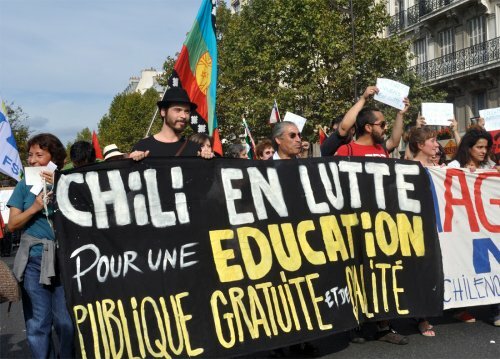 Le mouvement étudiant chilien a mené une bataille de 10 ans pour obtenir ces réformes. Il s’est agi là de l’action politique la plus importante et la plus soutenue du pays depuis le mouvement des années 80 qui avait conduit au retrait de Pinochet. Mais le mouvement n’est pas encore terminé - les étudiants ont pris goût à leur pouvoir collectif et demandent bien plus que ce qu’on leur a octroyé. Higher education in Chile will be free from March 2016, funded by US$8.3billion in corporate tax increases. Recently adopted legislation also ends government subsidies to for-profit schools, stops selective entrance policies in the public system and establishes a 10-year plan to provide free education for all primary and secondary students. The Chilean student movement has waged a 10-year battle to force these reforms. It has been the largest and most sustained political action in the country since the democratic movement of the 1980s, which eventually forced out Pinochet. But it is not over yet – the students have tasted their collective power and are demanding much more than what has been offered. Chile has one of the most pro-market and class-segregated education models in the world. Since 1980, enrolment in under-resourced public schools has dropped from 80 percent to less than 40 percent. Eighty-four percent of university education and 100 percent of technical education are privatised. The system is wholly based on a voucher system. The vast majority of students attending Chilean government schools are from the poorest sections of society. Until the current reforms, anyone could open a for-profit school with no requirements on quality whatsoever. In the tertiary sector, around 50 percent of the least wealthy students drop out of their degrees, which they have undertaken at for-profit, low-quality institutions where they are given little support and leave with huge debts. 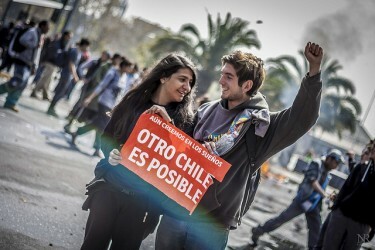 The most decisive period for the Chilean student movement was that of the mass struggles of 2011, sometimes called the “Chilean Winter”. Mass mobilisations, school and university occupations, an eight-month non-stop relay marathon around the national parliament building and the innovative use of social media to disseminate plans and ideas – all were used by the movement to increase participation and build popular support. There was a strong focus on developing links with workers’ struggles and building solidarity with organisations such as the Workers’ United Centre of Chile (CUT, the largest union federation). Largely as a result of the political pressure from the student movement, the centre-left Bachelet government won the 2013 elections and took office in March 2014. Several high profile leaders of the student movement were also elected to parliament, including some members of the Chilean Communist Party who participated in the Nueva Mayoria (New Majority) electoral alliance with Bachelet’s Socialist Party and others. In May 2014, before the reforms had been announced, 100,000 students protested in Santiago and elsewhere around the country. Then in June, soon after the first reforms were announced, another march of around 100,000 students took place in Santiago to denounce them as inadequate and unrepresentative of the movement. The protests had six key demands : strengthening public education ; free and fully funded education for all ; an end to the corporatisation of education and education for profit ; democratisation of educational institutions ; improvement of the working conditions of all those involved in education ; and abolishing student debt. Lorenza Soto, spokeswoman for the Coordinating Assembly of Secondary Students, said at a press conference : “No government or reform that does not meet all the demands of the student movement will stop us mobilising.” Soto also said that “students will determine when and why [they] mobilise … as long as ‘business’ remains in education, the fundamental problem is not being attacked”. The student protest was quickly followed by a mass march of teachers on 25 June. They pointed out that there can be no reform of Chilean education without teachers, and demanded full participation in the reform process, job security, wage justice, decent teaching conditions and professional respect. Secondary students resumed school occupations. At one point the mayor of Santiago was so pressured by the number of school closures that she approved two periods a week in the formal curriculum for students to discuss the reform process and the demands of the student movement. The students then agreed to end the occupations. But when all major student unions and the teachers’ union voted against participating in the government-led consultation agenda, the secondary students resumed their occupations. Another mass protest in August highlighted what the movement saw as attempts by the government to “negotiate” with the conservative side of parliament – the very actors who engineered the existing system and have always championed it. The students’ six demands highlight deeper tensions between the government’s agenda, the neoliberal education system as it stands and the aspirations of the students and their supporters. Perhaps the most important achievement of the Chilean student movement to date is its success in redefining the “public” to exclude profit making and commercial or market interests. Rather, “public” is understood as the use of taxation for the creation of non-commercial institutions for collective benefit. The students’ rejection of any reform that does not constitute a complete break with the market has pushed the whole debate to the left. In a global context of increased privatisation of education, this is a significant political development. The Chilean students emphasise the need to return to a fully publicly funded education system. They have argued that this is a necessary precondition for social equity and quality education. But they also argue that this achievement alone would be insufficient. The student movement, in working alongside and with other sectors in various alliances, has played a leading role in developing consciousness around the need for any reform to be based on democratisation. It realises that “public” cannot simply mean nationalisation. Instead, students and teachers have argued for community control rather than bureaucratic-government administration. There is a conviction that any meaningful reform is impossible without a mobilised student and teacher movement. Students and significant sections of the population have realised in practice that the degree of social mobilisation, in direct conflict with the political establishment, determines the extent to which government policy can be changed. The Chilean student movement to date has been powerful and wields significant political influence. These young people reflect a broader unwillingness to accept the continuing claims that neoliberal Chile is working for everybody. They are not only worried for themselves and their futures but also are deeply affronted by Chile’s economic and social inequality, and they understand and can critique the system that perpetuates it. However, the challenges facing the students also demonstrate the limitations of single-issue movements when they are restrained in their ability to link up with other forward-moving working class and popular movements. While the students have forged alliances with the labour movement and various other struggles, these have been limited by the lack of united leadership and organisation in the broader anti-neoliberal movement in Chile. The next period will be important. To what extent can the movement remain united and focused around political demands that seek much more than what the government is currently offering ? Even with the most sustained mass struggle, every victory is tenuous and partial. The future remains unclear, but to date the strength of the Chilean student movement has been its focus on mass mobilisations. 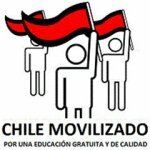 The current leaders have stated their commitment to continuing to organise and protest around the demand for a community-centred public system for the people, by the people, that puts education at the heart of a new, socially just Chile.